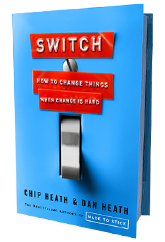 Following up on their first bestseller, Made to Stick, brothers Chip and Dan Heath have written a book that must be read by all, particularly if you are trying to understand the dynamics of change. You can click over to the website to learn more about the book. The authors' use of the metaphor of an elephant and rider throughout the book, helps the reader quickly understand that the rational side of us is the rider and the emotional side of us is the elephant. Often when the rider knows that a new path must be chosen, it isn't always easy to move the elephant in that direction. One of the mentioned ideas that caught my eye was where the brothers cite a grading system used by Jefferson County High School. Students can receive an A, B, C, or NY. NY standing for "Not Yet." Pretty clever.